New Movie Announcement: Mary Poppins Returns! 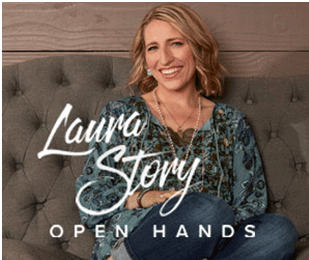 I love to listen to Christian music, so when I had the opportunity to review Laura Story's new CD, "Open Hands," I jumped at the chance. Fortunately, this album met my expectations ... and more! Not only are Laura's music and voice beautiful, but they especially reach out to touch the hearts of women and mothers. Laura has three children (including twins like me! ), and two songs particularly stood out for me as a mother. In explaining the song, "Give You Faith," Laura explains, "The most important thing that we could possibly give our children is to not just tell them about the faith that we have but to live out that faith as a family. Sometimes that means not giving them everything they want but showing them that the most important thing in my life isn't even them -- it's actually my faith in Jesus Christ -- and just point them to Jesus." She sings in "Give You Faith," "More than wisdom or wealth, More than happiness or health, May you say I gave you faith." It's such a wonderful goal for parents to have when it comes to raising children. Another song that really resonated with me as a mother was "Grace Abounds." Laura wrote this song after watching so many horrible stories on the news and reading headlines that really caused her to reflect on the world her kids will grow up in. Laura says, "When it feels like hope can't be found, when we don't even know how we're going to put one foot in front of the other, Scripture teaches us that's when grace abounds." We all want our kids to know that life isn't always going to be great, and bad things happen, but comfort can be found in God's grace. Watch this video of another beautiful song from this CD, the title song "Open Hands." 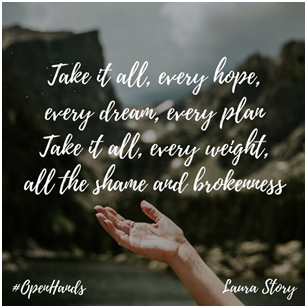 Honestly, I could go through every song on this CD and explain how touching and meaningful each one is, but I hope you'll pick up a copy of "Open Hands" for yourself so you can find hope and inspiration over and over again when you listen to Laura Story's beautiful voice and lyrics. I have been authorized to give away an "Open Hands" CD by Laura Story to one lucky winner! Enter through the Rafflecopter form below. This giveaway is open to U.S. residents only and ends at 11:59 PM EST on Sunday, March 19, 2017. Only one entrant per mailing address, per giveaway. If you have won a prize from our sponsor Propeller /FlyBy Promotions in the last 30 days on the same blog, you are not eligible to win. Or if you have won the same prize on another blog, you are not eligible to win it again. Winner is subject to eligibility verification. Disclosure (in accordance with the FTC’s 16 CFR, Part 255: “Guides Concerning the Use of Endorsements and Testimonials in Advertising”): Many thanks to Propeller Consulting, LLC for providing this prize for the giveaway. Choice of winners and opinions are 100% my own and NOT influenced by monetary compensation. I did receive a sample of the product in exchange for this review and post. This post contains my Amazon affiliate link, and I will receive a small commission on purchases made through that link. I learned she has also written a book called When God Doesn't Fix It. I learned that Laura's husband, Martin, has a brain tumor that has resulted in other disabilities and challenges for them. I learned that her husband, Martin, was diagnosed with a brain tumor in 2006. I learned she is a worship leader at a beautiful church. I learned she has a book! I learned that she has a book called "When God Doesn't Fix It". I love her life story. I saw her in concert two years ago and I really enjoyed her so much. I learned that she is a Grammy award-winning artist. I learned that her song “Faithful God” is one of her favorite songs on the CD. i enjoyed reading why she wrote when God doesn't fix it. I learned that Laura is a worship leader at a church in Atlanta. I learned she is a Grammy winner. I learned that she has won a Grammy. So talented! i had never heard of her before but i learned she is a Grammy award-winning artist, speaker, songwriter, author, and worship leader. My son and I love them all but he says the hoodie teddy bear is his favorite.